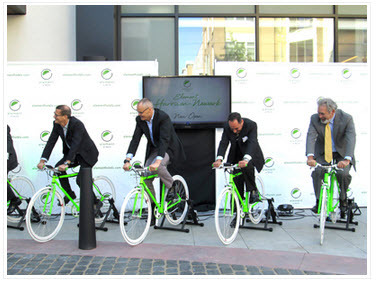 Starwood Hotels & Resorts Worldwide opened its 14th Element hotel in Harrison last Thursday with members of the development team pedal-powering a virtual ribbon-cutting at the new location, 399 Somerset St., just off Frank E. Rodgers Blvd. South. on wellness and sustainability,” he said. Last Thursday in Harrison, the hotel’s builders and managers mounted bicycles attached to bike generator stands and, as they worked the pedals, they generated enough electricity to power a flat screen plasma monitor to create an “official opening’’ message on screen. The Pegasus Group and managed by Crescent Hotels & Resorts. The hotel, which opened to guests Aug. 21, features a 24- hour fitness center, indoor pool and a 1,500 square foot meeting room. Wi-Fi throughout the facility, breakfast, an evening reception and salon bar carts stocked with wines and beers, soft drinks and snacks available after hours. About 8,000 square feet of the ground floor space is dedicated to retail use. A 2,200 square foot Dunkin’ Donuts has already opened; AT&T will be leasing a 1,500 square foot retail space later this year; Cork Wine & Liquors will be occupying 2,000 square feet in 60 to 90 days; and a retail food shop is planned for the remaining 2,000 square feet, according to Michael Barry, principal of Ironstate.